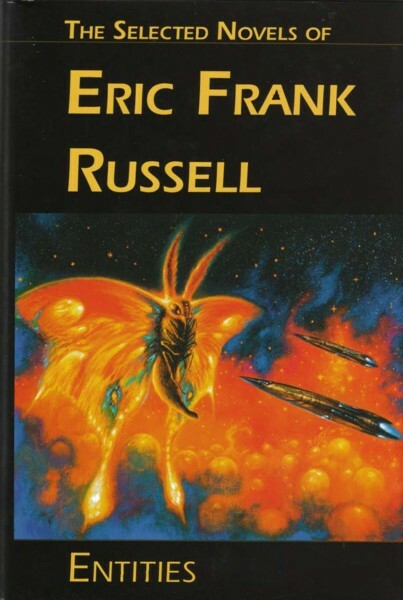 Copyright © 2001 by the Estate of Eric Frank Russell. Next of Kin © 1959, 1964 by Eric Frank Russell. Sinister Barrier, Legwork, Mana, Mechanical Mice copyright © various dates by Eric Frank Russell. Copyright © 2001 by Thomas Bouregy & Co., Inc.
Wasp © 1957 by Thomas Bouregy & Co., Inc.
Sentinels from Space © 1953 Thomas Bouregy & Co., Inc. Call Him Dead (Three to Conquer) © 1956 Thomas Bouregy & Co., Inc.
Introduction copyright © 2001 by Jack L. Chalker. Editor's Introduction copyright © 2001 by Rick Katze. Dust Jacket Illustration © copyright 2001 by Bill Eggleton. "Dust jacket illustration by Bill Eggleton" on bottom front inner flap dj. Design by Alice N. S. Lewis. "Edited by Rick Katze" on title page. Editor's Introduction ends with Rick Katze (over) Norwood, MA. (over) July 2001. All novel introductions are title followed by "Introduction by Jack L. Chalker". Each novel follows after introduction. Pages given are the actual start of each novel. Legwork has Astounding, April 1956 under title on story title page. Mana has Astounding, December 1957 under title on story title page. Mechanical Mice has Astounding, January 1941 under title on story title page.